Hi, one technique which has received renewed popularity in recent months is the Eclipse technique. It is a surprisingly simple one but one which, I think, looks so effective. You can create a really subtle look like the card I have or you can do something which is much bolder. 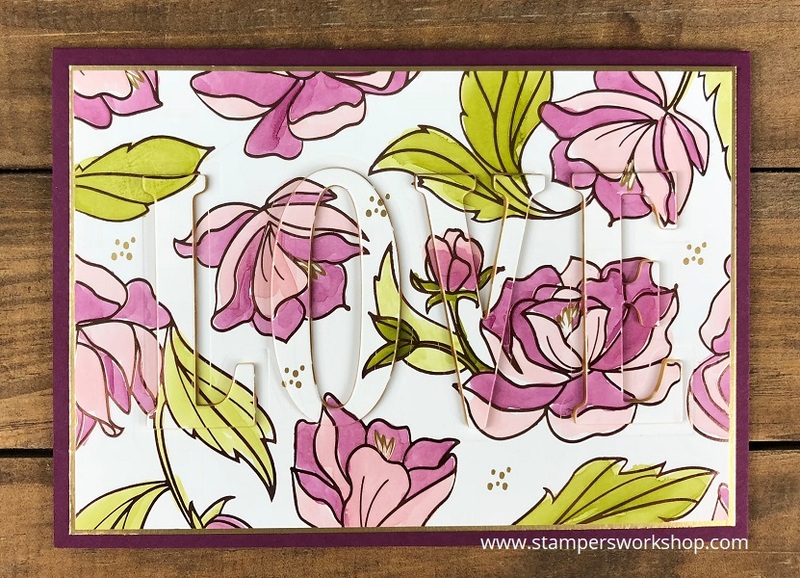 To create the card, I coloured the new Springtime Foils Specialty Designer Series Paper with my Stampin’ Blends! Yes, I LOVE colouring with these markers! I placed the letter dies from the Large Letters Framelits set in the position I wanted them and used a post-it note to hold them in place. Then I ran this panel through the Big Shot. Be careful not to lose any pieces as you need them all for this technique. The next step is to adhere your die cut panel to either your card base or in this case another panel of a gold foil sheet. If there are any ‘centres’ of letters, like for the O, make sure you stick them down to this panel as well. I then used the Mini Stampin’ Dimensionals to pop the die cut letters back in place. I then layered this complete panel to a Rich Razzleberry cardstock base. The beauty of a technique like this is that it works with patterned paper, like my card above, or you could stamp your own background. Have you given this technique a try? I hope you do!